Happy early Mother’s Day! 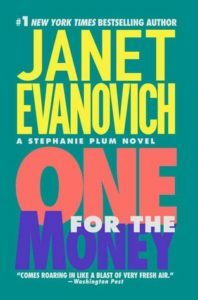 Kait, Renata, and their guest Rachel read their moms’ favorite book, One For the Money by Janet Evanovich. It’s the origin story of Spandex-clad rookie bounty hunter Stephanie Plum. Fellow Jersey Girl Kait has a lot to say about the book’s portrayal of Trenton, Renata has a lot to say about her mom, and Duarte has a lot to say about Stephanie’s pet hamster. This episode will give you plenty to talk about at your next charmingly awkward family dinner–just make sure to take your gun out of your purse before you head over there. Candy pairing: Kait says Warheads, Rachel says a Bubble Beeper, Renata says sugar free Baskin Robbins hard candy. Coming up next: Ruthless.com by Tom Clancy & Martin Greenberg.